It snowed during the night. The trees are outlined in white, dark branches and trunks providing beautiful contrast. The clouds are already breaking up, blue sky to the south growing bigger every time you look away. Winter is finally here. 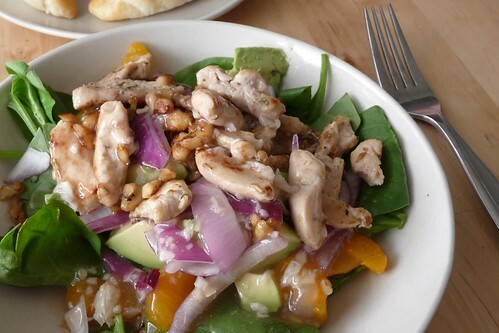 But that doesn’t mean that I’ll give up salads, like the fantastic warm spinach, chicken and mandarin salad below. Warm salads, along with soups and stews, will become everyday staples again, now that it’s cold and running the oven becomes a pleasure. The temperatures are hovering right above freezing for the next few days. I’ve been waiting patiently for Winter so I can enjoy the dishes that are misery to cook in any other season. In any case, this warm salad is a wonderful dish to eat while baking or watching the snow or leaves fall. I hope it brightens your gloomy day as much as it did mine. On two salad plates, arrange spinach, oranges, avocado and onion; set aside. In a skillet over medium heat, saute chicken with rosemary, salt, pepper and walnuts in oil until chicken is no longer pink. Remove to waiting salads. In a small bowl, combine the cornstarch, garlic, pineapple juice and vinegar until smooth. Add to skillet and bring to a boil; cook and stir for 2 minutes or until thickened and bubbly. Pour over salads and serve. This entry was posted in chicken, dairy-free, gluten-free, recipes, salad, untranslated. Bookmark the permalink. You’re very welcome. :) Thanks for reading!